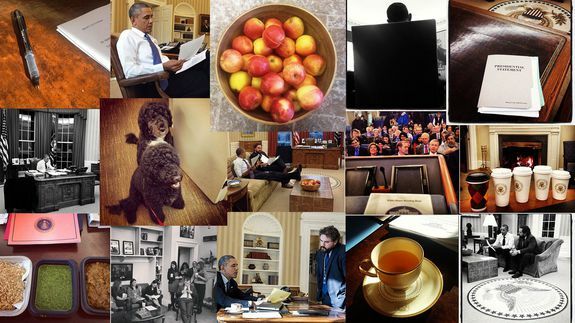 Critics Charge White House Not Nearly as Transparent as Its Instagrams - trendistic.com: ever tried. ever failed. no matter. try again. fail again. fail better. As President Barack Obama prepares for one of his most important speeches of the year, he looks at a piece of paper with his chief speech writer. Someone on his staff eats Indian food — spicy eggplant. The press secretary talks to the press and drinks a lot of coffee. The Obamas’ two dogs — Sunny and Bo — sit nearby. Only someone with extensive access to the President and his team could know all these intimate details, right? Not quite. These days anyone with a free smartphone app, or even just an Internet connection, can have this kind of “inside” access.